Situated in the picturesque village of Bagnall in front of the Village Green, The Stafford Arms is at the centre of Staffordshire life, providing a social meeting place for an informal drink, a light lunch or a full a la carte meal. This picture postcard pub with log burning open fires and Homemade cuisine, offers diners and drinkers an easy, relaxed atmosphere. The menu covers an exciting range of homemade dishes, from modern British classics to the more contemporary. 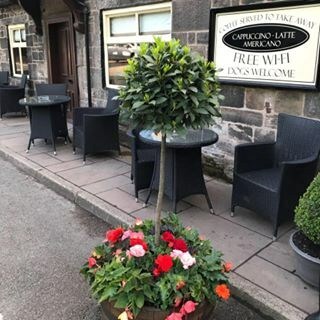 They can be enjoyed in our award winning Stafford Dining Room, Stables Dining Room or even a cosy corner of bar, and when the sun shines one of our Patio areas. If its a pint, a glass or two of wine, a bar snack or an evening of fine dining, The Stafford Arms provides a striking setting to experience outstanding food and exceptional service in a truly relaxed atmosphere. Myself and family had a lovely lunch hear on Thursday,staff were very efficient and food was lovely . Some staff seemed a bit moody and slammed plates down, other staff were very nice. Food average but good value for money. Not much atmosphere. shame really we booked for a special occasion and it was average. We had a super evening with delicious food and service. Joined the Gold Card Scheme and plan to visit again soon in an evening however have already popped in for lunch since. We haf the Sunday Roasts I had pork and my partner had beef.They were delicious..
Super food and lovely staff. That's the reason we keep coming back. Very family friendly pub, great service, nice cocktails, good food. We always enjoy a warm welcome and the food is lovely whether we eat in the restaurant or the bar (with our little dogs). We love the Stafford Arms, we had a 90th birthday party celebration for mum 2yrs ago and your staff provided a wonderful buffet for family and friends. I'm happy to say mum celebrated her 92nd birthday again at the Stafford Arms last Sunday and once again we thoroughly enjoyed ourselves. The pie was absolutely amazing! Excellent service from all staff. Very welcoming without being too fussy. Food lovely too - keep up the good work !